Dubai Holding (rather than Dubai Holdings or Dubai Holding Company) is a substantial umbrella or holding company created by the Dubai Government in 2004 to develop large infrastructure projects in Dubai. The CEO of Dubai Holding was Mohammed Al Gergawi (sometimes spelt Mohammad Al Gargawi / AlGergawi) until March 2009 when Ahmad Bin Byat (Ahmed Bin Bayat) was announced as the new CEO on 07 March 2009. Mr Bin Byat is also Chairman of the Emirates Integrated Telecommunications Company (EITC or Du), Chairman of the Dubai Real Estate Corporation (DREC), Chairman of the Aswaaq Founding Committee, Secretary-General of the Dubai Executive Council, and a member of the Zayed University board of trustees. Mohammed Al Gergawi is still Chairman of Dubai Holding. 26/27 June 2009 (news reports and Emaar press release): Emaar Properties (not a DH company) and three DH subsidiaries Dubai Properties, Sama Dubai, and Tatweer, will merge into one property company. Timeline of consolidation from June to October 2009. Talk is cheap though, in March 2007 Emaar and DH announced a land for shares deal. It came to naught in the end - Emaar cancelled the deal in August 2007. February 2009: DH announced that back office operations of 3 of its subsidiaries had been merged. The companies are Dubai Properties, Mizin, and Sama Dubai. Maturity dates of Dubai Holding bonds in 2012, 2014 and 2017. Dubai Holding outstanding debt estimated at $14.8 billion (Reuters 01 Oct 2010), or $12 billion (Bloomberg 29 November 2010). The Dubai Government has contributed $2 billion towards payment of Dubai Holding debt from November 2009 to November 2010 according to comments from Mohammed Ibrahim Al Shaibani, the director general of Dubai ruler's court (Bloomberg 29 November 2010). Table of outstanding debts below is not complete. Dubai International Capital LLC (DIC) is an investment unit of Dubai Holding. Dubai Holding Commercial Operations Group LLC (DHCOG) is a subsidiary of Dubai Holding. A revolving credit line of AED 2 billion ($555 million) was being extended through 2010. The loan is provided by Citigroup Inc., Royal Bank of Scotland Group PLC, and Standard Chartered PLC. October 2010 - one month extension on loan to 30 November 2010. July 2010 - two month extension granted. 16 August 2009 update (press release from DH): Dubai Holding operations will be restructured into 4 different business units - Business Parks, Hospitality, Investments, and Property. Information below might need updating once further details of the restructuring become available. 29 October 2009: Ahmad Bin Byat appointed as acting chairman of Dubai Properties group. Previous chairman is reportedly under investigation for "alleged financial irregularities" (Maktoob Business and Emarat Al Youm report). 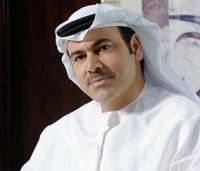 29 August 2009: The new Dubai Holding property vertical Executive Chairman is Hashim Al Dabbal. Mr Dabal was previously Executive Chairman of Dubai Properties Group - one of the old DH subsidiaries. Property Group CEO will be Khalid Al Malek, previously Chief Executive of Tatweer. Acting CEO of Tatweer will be Dr Muhadditha Al Hasimi. 22 August 2009 (DH press release): The DH property subsidiaries Dubai Properties, Sama Dubai, Tatweer have merged into a single unit, as yet unknown what name (Dubai Properties perhaps?). This includes the real estate development projects of Bawadi, Business Bay, Culture Village, Dubailand, Remraam, The Lagoons, The Tiger Woods Dubai, among others. 22 August 2009 (DH press release): TECOM Investments, Dubai Healthcare City, and Dubai Industrial City have merged into Dubai Business Parks (or DH Business Parks). 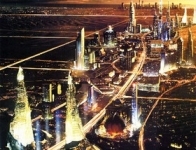 Dubai Group - finance, real estate, industry, manufacturing, telecoms. Subsidiary companies include Dubai Banking Group, Dubai Capital Group, Dubai Financial Group, Dubai Insurance Group, Dubai Investment Group, Noor Investment Group. Bawadi (part of Tatweer) - an AED 200 billion tourism development. Dubai Healthcare City (Tatweer) - develop medical treatment and research facilities (near Wafi City in Bur Dubai). In February 2009, Dubai Holding announced that some operations of their real estate subsidiaries, namely Dubai Properties Group, Mizin (a Tatweer subsidiary) and Sama Dubai would be restructured and merged, but ownership and activities would continue under the separate business units. The Dubai Holding Commercial Operations Group (DHCOG) is also a subsidiary of Dubai Holding (DH), which owns several DH members (or the DH stakes in the following member / subsidiary companies): Dubai Properties, Jumeirah Assets, Jumeirah Group, Sama Dubai, Tatweer, TECOM Investments. 07 September 2010 - Dubai Holding Commercial Operations Group announces that it will defer payment again, to November 2010, on a loan of $555 million loan. 2009 - loss of AED 22.8 billion ($6.21 bn), outstanding debt estimated at $4.08 billion according to JPMorganChase & Co (Bloomberg 16 September 2010). Dubai Holding Investment Group (DHIG) is also a subsidiary of Dubai Holding, which owns the DH member companies Dubai Group (DG) and Dubai International Capital (DIC). In February 2009, Dubai Holding announced it would merge some Dubai Group and Dubai International Capital operations, and the individual chairmen would become chairmen of Dubai Holding Investment Group - Soud Ba'alawy of DG and Sameer Al Ansari of DIC. Dubai Holding is not related to a smaller company called Dubai Holding Group LLC which is a Dubai based retail group, established in 2000, with franchises in international fashion labels including Gerard Darel, Promod, Stradivarius, women's secret, Zara, Zara Home; and retail outlets in Bahrain, Oman, Qatar, and the UAE. www.dubaifaqs.com/dubai-holding.php (PDF and print version).